When it’s time to move beyond simple document storage and retrieval to get the most out of their technology solution, businesses evolve to ECM (enterprise content management). 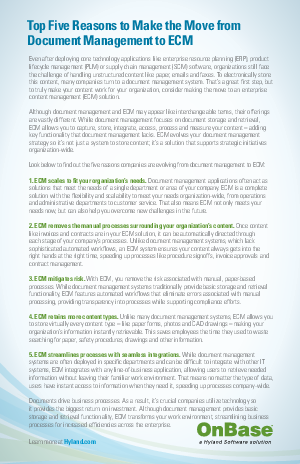 ECM goes far beyond the basic functionality of document management to capture, store, integrate, process and measure. A strong ECM solution improves efficiency of administrative tasks by automating manual processes. Businesses speed processing and streamline the management of common documents such as invoices and contracts, saving time and money, and eliminating errors associated with manual processing. Your solution should also be scalable enough to fit the needs of the entire enterprise and integrate with any application so users are adopting the solution in a familiar interface. By adding key functionality that document management lacks, ECM lets you boost efficiency and transform the way departments interact.